Thankfully, all of these cars come with a five-star safety rating. However, it's worth mentioning that the Tesla Model 3 did exceptionally well in the side impact test compared to the Volvo S60. The Tesla Model 3 has been called a mass-market EV. But that’s really not true. It’s more like an entry-level luxury vehicle that stands up pretty well to its peers. 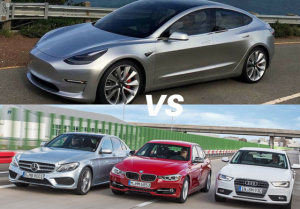 In this post, we compared Tesla Model 3 versus entry-level luxury vehicles such as the BMW 3 Series, the Mercedes-Benz C-Class, and the Audi A4 to see how it stacks up. The BMW 3 Series offers a classic look with premium finishes and great acceleration. When it comes to entry-level luxury or compact executive cars, you’re looking generally at cars under around $50,000 which offer a great driving experience. The class leader in this category for a long time is the BMW 3 Series. The 2017 BMW 3 Series offers loads of options that can make it work for nearly any budget. For many, this car is a timeless classic. In 2017, BMW has revised their naming of the various trim levels and revised exterior trim, interior color options, with the sport and luxury lines being wrapped up in two separate packages. The Sedan version of the 3 Series is BMW’s bread and butter. They also offer a Sport Wagon and Gran Turismo body style. the Audi A4 is another leader in its class. The Audi A4 is another compact Sedan in this category which originally introduced in the United States at around 1996. It has a timeless design similar to the BMW and offers decent acceleration with some pretty cool tech inside. The new Audi A4 has a virtual cockpit inside with a 12.3-inch screen that replaces the traditional gauges and buttons. Even they know that buttons have been on their way out since the original iPhone was released. Now, like the BMW 3 Series, another leader in this category is the Mercedes-Benz C-Class. The C-Class is no longer Mercedes only option in the entry-level luxury category. 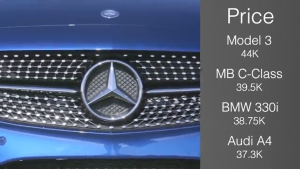 The Mercedes C Class offer loads of powertrain options and body styles. They have three performance AMG models to choose from, and, as you might expect, the interior finishes for the Mercedes are second to none in this category. In 2017, Mercedes added the rear-view camera as standard equipment and put out some new colors for you to choose from. Starting from the top, you have the Tesla Model 3 taking the cake here with 126 miles per gallon equivalent. Then the rest of them are actually almost the same. 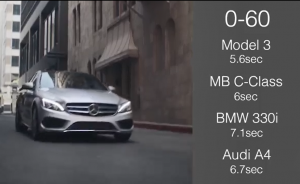 The BMW slightly edges out the Mercedes and the Audi with 29.5 miles per gallon, the Mercedes and Audi tying for 29. That is an average between the highway and city miles. So, like that MPGe, the miles per gallon equivalent, we have a different way of coming up with the horsepower number, because an electric motor doesn’t really operate the same way a regular motor does. In fact, Elon has even stated that a better way to measure this would be in g-forces. we do have the EPA estimated horsepower number for the Model 3. So coming in again on top, you have the Tesla Model 3 with 258 horsepower. Then you have the Audi A4 with 252 horsepower. 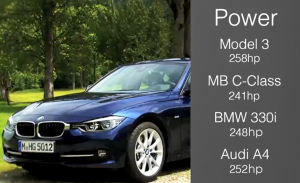 The BMW 3 Series with 248 horsepower and the Mercedes-Benz C-Class rounding out the bottom with 241 horsepower. So part of the thing here is the electric drivetrain has some real standout advantages for the acceleration and everything that’s why, almost always, you see an EV, especially a Tesla, win in the performance category. If we’re looking at the Tesla Model 3 Long Range, we have the highest price in the category of $44,000. Next on our list would be the Mercedes-Benz C-Class C300 at 39.5. Then you have the BMW 3 Series, the 330i coming in at $38,750. And the 2017 Audi A4 with our cheapest car in the category here at $37,300. Now, this is before any other tax incentives or things that may reduce the cost of your Tesla Model 3. you also could go with the Standard Model, the $35,000 one. But since we’re comparing this to luxury vehicles, we thought it made sense to use the higher-end version. Now, when it comes to miles per gallon, obviously, the Tesla Model 3 doesn’t take gas. And so what the EPA has done is they’ve come up with something called MPGe, which is miles per gallon equivalent, as a way for us to try to compare its mileage or its range or its efficiency to a regular gas-powered car. The Tesla Model 3 released and its making major waves in the affordable luxury segment. While it’s been called a mass-market car with a base price of $35,000. we now know that most of the options you’re going to want will easily push you into the $50,000 range. The interior is completely free of buttons and controlled by a 15-inch center console. It has been placed perfectly for the driver to see from their peripheral vision. It is also used for passengers to use to control things like music and navigation and some of the other features. Every Model 3 comes with the hardware to one day be full self-driving, and they already offer the enhanced autopilot ability, making those hours spent in traffic a little bit more bearable. Because the motor is mounted underneath the rear seat, the Model 3 includes a sizable trunk as well as a small trunk area in the front called a frunk. A complete newcomer to this category would be interesting to see how it stacks up against the competition. Now, let’s take a look at the 0 to 60 times to see how it works with the acceleration. Coming in on top again, you have the Tesla Model 3 with the 0 to 60 time of 5.6 seconds. Next, to that, you have the Mercedes-Benz C-Class at six, the Audi A4 at 6.7 seconds and the BMW 3 Series at 7.1 seconds. Overall, pretty fast cars. All of them around is going to be quick enough to get the job done for sure. 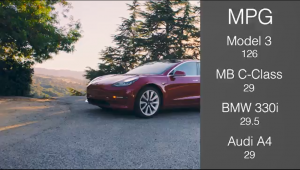 The Tesla Model 3 here does really stand out as the highest performing vehicle in its class. All the cars we’re looking at here are five-seaters, but when it comes to space in the interior, the Tesla Model 3 just barely edges out the BMW 3 Series, with similar headroom, similar legroom, but over an inch more of shoulder room. So, if you’re a bigger or taller person, this might be something to try out before you buy. Make sure that you’re going to fit and feel comfortable driving around in it. As for cargo space, none of these cars are going to give you a tremendous amount of storage, but the Tesla Model 3 is tops again with 14 cubic feet, with the BMW 3 Series and Audi A4 tied for second at 13 feet, and the Mercedes-Benz C-Class coming in last at 12.6 cubic feet of storage. Now, a quick side about the electric motor, specifically, how Tesla has done the electric drivetrain. The Model 3’s big brother, the Model S, recently went head to head in the ultimate drag race from Motor Trend. they pitted supercars, cars that are generally way outside of the price range of the normal person and they put them against a car that is somewhat in the range, the Tesla Model S P100D. And the P100D smoked the competition in the quarter-mile track. Now, on a longer track, the other cars probably would have won because they would have caught up. They were still accelerating, where the P100D had already hit peak acceleration. But, honestly, it doesn’t matter. All of these cars are incredibly fast. And an interesting thing about this is that the P100D in this drag race was the heaviest car. So the power that you get from the electric drivetrain truly is second to none. Thankfully, all of these cars come with a five-star safety rating. However, it’s worth mentioning that the Tesla Model 3 did exceptionally well in the side impact test compared to the Volvo S60. So there you have it, a side-by-side comparison of all of the leaders in the affordable luxury or entry-level luxury market. So are you looking at getting one of these cars? Which way are you leaning and why? what is the deciding factor for you? So please leave me a comment down below. May I add that Tesla is also 0 emissions, which is great for our environment and communities, without sacrificing comfort, performance and design. That is the main reason why I made it my choice. The $44k Model 3 does 0-60 in 5.1 seconds (has tested as low as 4.6). You’re article is using the price of the Long Range version, but the lower specs of the yet to be released $35k version.